Our historic House and Cottage were built in approximately 1812 with the Cottage used as servants' quarters. Records indicate that the House is one of the oldest in Summerville, its architecture typical of early 1800s Low Country homes with the main floor built several feet off the ground, with high ceilings and many windows. Situated on a pine-forested ridge, Summerville was first inhabited in the late 1700s as Charlestonians and other inhabitants of the South Carolina Low Country sought respite from the summer heat, mosquitos and the possibility of disease. From May to September, plantation families along the nearby Ashley River and other coastal areas headed for higher elevations to live temporarily in the small, pine-forest colony appropriately dubbed Summerville. Despite Summerville's beauty and appeal, its population hovered around 3,000 for almost a century, and didn't reach 6,000 until the late 1970s. Then, as a bedroom community for the larger Charleston area, the charm of Summerville was realized and resulted in the doubling of the population in the 1980s. Summerville continues to attract families, businesses and military personnel, all looking for a quality of life that has long since disappeared in most cities. 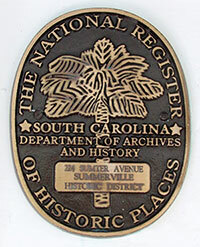 It is hard to believe that 40 years ago the Town of Summerville had a population of 3,000 and today it exceeds 46,000. Summerville is nicknamed The Flower Town in the Pines because of the number of pine trees in the area. Since the early 1900s, tourists have flocked here during early spring to enjoy millions of spring blossoms, particularly azaleas and camellias, in private and public gardens, including Azalea Park (a short walk from the Cottage). The annual Flowertown Festival, one of the largest arts and crafts festivals in the southeast (and a fundraising event for the Summerville YMCA), happens each spring and attracts thousands of visitors and locals to Azalea Park. David and Jennifer Price are the sixth owners of the House and Cottage, and interestingly, several of the previous owners were closely related. The Prices have owned the property since 1974. Over the years, the Prices have lovingly maintained and modernized the Cottage while keeping its historic charm and ambiance. In fact, the restoration of the Cottage received the coveted Preservation Award of the Summerville Preservation Society – a testament to David and Jennifer's commitment to making your stay the best it can be. And the property has been added to the National Register of Historic Places. Price House Cottage is simply one of the most luxurious and comfortable accommodations you will find – in a unique and private setting. The Cottage has its own private paved driveway with off-street parking. The innkeeper's house and the Cottage are about a hundred feet apart so you'll feel you are in your own private oasis. Just outside the Cottage is your own brick patio, ideal for coffee in the morning, al fresco breakfasts or afternoon libations. Every detail has been planned for guests to have a memorable experience where luxury, comfort, and friendliness exist together. Both Jennifer and David are accomplished cooks and enjoy preparing the breakfasts for guests. A daily breakfast featuring freshly squeezed orange juice, and innovative and delicious gourmet presentations of fruit dishes, waffles, french toasts, eggs, and baked goods is served in the Cottage. We are happy to consider your food likes and dislikes; please let us know your preferences and any food allergies prior to your stay. 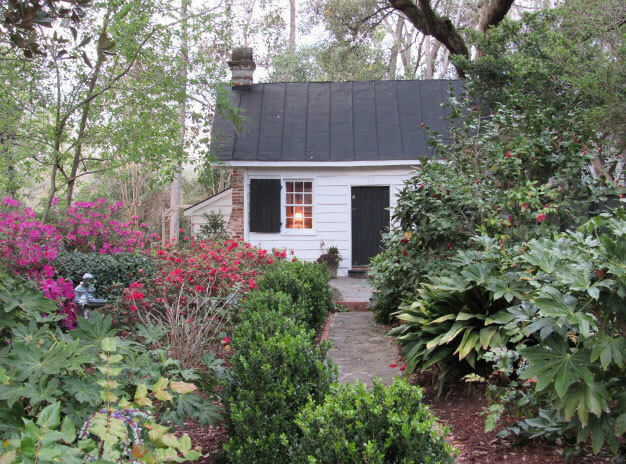 A multi-page article entitled "Garden Home" about David & Jennifer Price's home and lovely Cottage was published in the Fall 2016 issue of Azalea Magazine.